Welcome to the Autodesk Project Butterfly blog. 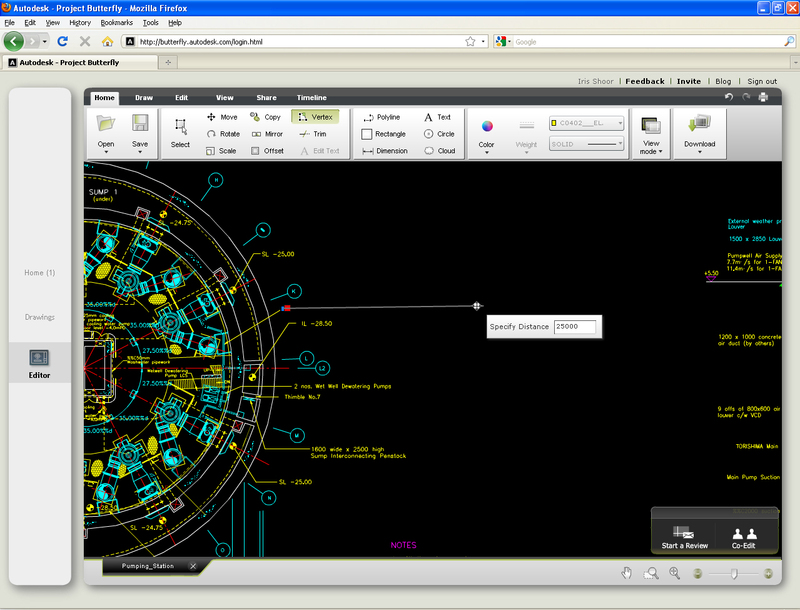 Project Butterfly is a new Web CAD application from Autodesk that lets you edit and share AutoCAD drawings online from a Web browser without having to install or download anything. Project Butterfly provides features that help you accelerate and improve the design process, bridging the gap between you and the people you work with. 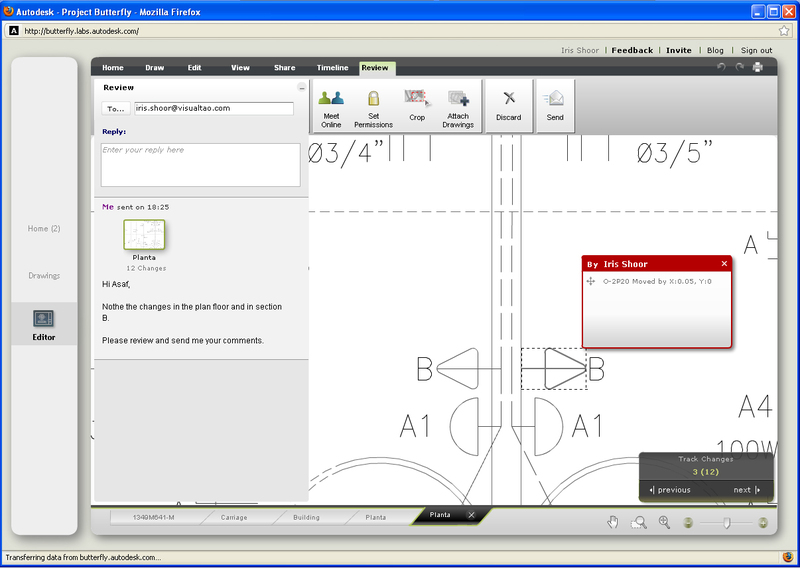 Edit and Access: With Project Butterfly your AutoCAD drawings are available to you from anywhere. You can open them and even edit them from any computer, using just a Web browser. Project Butterfly’s editor is powerful and accurate while being easy to use, even for non CAD professionals. Of course, you can download your drawings back to your computer after making changes to them. Sharing: Sending files is a thing of the past. With Project Butterfly, you can have your colleagues, clients or friends view or edit your drawings online by sending them an invitation. Just like you, they open them up in their browser, so they don’t need CAD software or the drawing files. In fact, they don’t even need to have a Butterfly account, they’re like guests in your drawing. No copies of your drawing are created in the sharing process, so any changes your recipients make are applied directly to the drawing, so you don’t have to manage multiple files and different versions. Meetings: Invite other people to an online meeting, where both sides discuss and edit the drawing in real-time. Yes, both sides can edit the drawing simultaneously. You can control whether participants can edit the drawing or only view it, by setting permissions. As before, you can invite anyone to co-edit with you. Your participants don’t need a Butterfly account or any software. Reviews: Reviewing in Butterfly is easy. You can start a review right from the drawing editor, and you don’t have to send any files. You invite your recipients into the drawing environment, and in it they can edit and annotate the drawing. When they’re finished, you can track their changes step by step. Your reviewers are not restricted to markups which you then have to re-draw, but can easily make the changes themselves. Spend less time sending files, interpreting and implementing comments – spend more time designing. Documentation: Each drawing in Project Butterfly has its own timeline which allows you to instantly view all past versions, reviews and meetings – so you don’t have to dig up old e-mails or create periodic backups of your drawings. The purpose of this blog is to give you, our community of users, an opportunity to communicate with the development team. We want to answer questions and get feedback and ideas that will shape our product. Our goal is to make your online CAD experience the best possible. Tal, Iris, Asaf and the rest of the Butterfly team. This entry was written by Butterfly, posted on January 19, 2010 at 2:29 AM, filed under News. Bookmark the permalink. Follow any comments here with the RSS feed for this post. Post a comment or leave a trackback: Trackback URL. Why not Native Client + O3D or Native Client +WebGL? I am trying to download my file to autocad 2007 and I only get to a blank screen at http://tomcat-comp-load-balancer-1896643123.us-west-1.elb.amazonaws.com/main/download. How can I save the file to my computer?